It’s a fact that Millennials prefer and seek out print. Yes, you heard me – print! Just like digital directly targets our pleasure centres and acts like an addictive drug spiking our dopamine and driving our serotonin to an 11, print (in all of its physical manifestations) is tactile, real, doesn’t interrupt us, has an actual endpoint (as opposed to the cacophonous tributaries that online offers), and seems to nourish our senses on a multitude of levels. Even our Gen Z nine-year-old craves real books, dragging them from room to room in our home, or house-to-car/house-to-plane when we travel. He could, of course, read online or on a tablet, but he lights up (not from a screen) with the page turning of a very tangible book in hand. 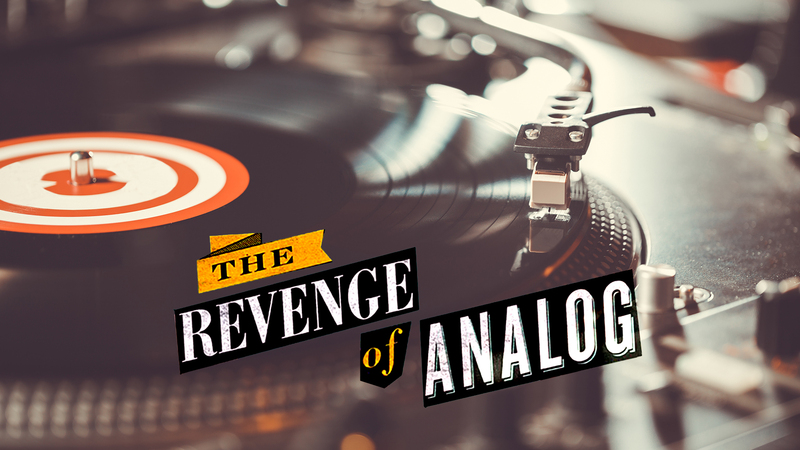 It will be interesting to see if records, film and other analog fascinations are simply a throwback fad, or if these trends are somehow symptomatic of our innate cravings for the palpable. As I have extolled in past Mashups, and our Print in a Digital World Trend Reports, the meeting of the Gutenberg Press and the Internet is truly a perfect storm – an intersection of two of the best transfer mechanisms of the ages. As humans, we thrive in a hybrid world where we can go fast and slow at the same time, where we can delve and dabble simultaneously, where we can have our cake and download it too… where we are digital and analog all at once. We live in exciting, transformative times and we have to always remember that we are harnessed to dopamine, slaves to serotonin – creatures, that by our very nature, are wooed by the novel, the new, the flashy fidget spinners of the world. So when you’re planning your next marketing incursion, don’t forget to tap into all that is possible as our old analog friends make a comeback and our human needs continue to drive our choices.